If you are working on Java Persistence API JPA on tomcat or any other web server this would be happening if you have multiple threads going off for connections. The rule of thumb shall be to have one EntityManagerFactory and get EntityManagers out of it. Hence we would have one factory but multiple products that would take care of closing and managing them selves. 1. Do you instantiate Persistence.createEntityManagerFactory(“name”) from multiple places? If either or both of the above have yes, then here is the solution. One major part on JSF would separation of concerns even for beans. As a rule of thumb beans related to model are session beans and those which have actions to be taken care of are requested one. So, In this particular scenario we would have two beans. Basically we don’t want to include any logic inside the session bean, rather we would add session bean as a member variable to request bean. Lets take a simple registration process. * Action handler for Contractor save. So the key thing here would be the @ManagedProperty part. That would inject the session bean into the request bean without creating any instance of it. *Don’t for get to add getter and setter for the session bean you are adding otherwise you would get an error. Without knowing if it is the best approach or not, I will post how I solved the multiple file upload problem in JSF as follows. As you can see, the file would be dealing with a single backing bean property uploadedFile. You would tomahawk for the file upload one. There is also file upload in richfaces as well. You can get the uploaded file from org.apache.myfaces.custom.fileupload.UploadedFile. Then have a normal getter and setter for both. When the file is requested, add it to the list of the uploadedFiles. For the action which would would do the actual uploading of the file, I have used the snippet from http://balusc.blogspot.com/2008/02/uploading-files-with-jsf.html. // Prepare filename prefix and suffix for an unique filename in upload folder. // Prepare file and outputstream. // Create file with unique name in upload folder and write to it. // Always log stacktraces (with a real logger). This error is quite explanatory in JSF. I got once in a while when I work with dynamic generation of the components. If you have this, the most common cause of this error would be you are trying to attach the an html component from your bean again. Especially, if you have session scoped managed bean and you are attaching dynamically elements, may be one of your methods has already attached the component to the view (like the grid you are using for your component) and the other method is trying to attach it again. If that is the case you might need to check the existence of the component in the grid (or any component you are using) before attaching it. 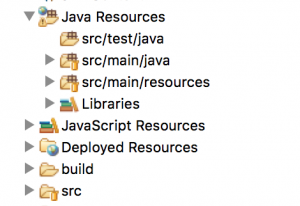 Probably you are using maven and wanted to change the directory structure. Here is how to do it in eclipse. First create the folder structure on the project in which ever way you would want to do it. I would use simple command like mkdir folderName to create it. 1. right click on the project, and hit refresh, make sure the folders you created are listed there. 5. Hit the Add newthen select your folder structure there. This would change the original structure of the your java project from src to the one maven compatible. A continuous and erratic error you would see on the console of this title might come across your JSF development once in a while. Also you may see the browser is taking long while this error happens. A kind of friendly error that would bade a visit while working on JSF and Tomcat would be: java.lang.NoClassDefFoundError – javax/servlet/jsp/jstl/core/Config. Thankfully, this has a very simple remedy of adding JSTL jars of standard.jar and jstl.jar.